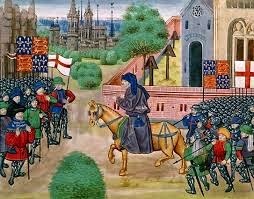 In 1348, the Black Death killed over one third of England's population, it was the first link in a chain of events that would, over thirty years later, result in what is now known as the Peasants Revolt. The second link in that chain was a shortage of people to work the land and it was this that gave the peasant population the ’upper hand’ causing them to demand higher wages. To counter these demands taxes were implemented, three poll taxes were introduced over a four year period that saw everyone over the age of fifteen paying one shilling each, this tax was crippling, it was the seeds of civil unrest. Unlike plots against government, such of the Gunpowder Plot in 1605 or the Babington Plot in 1586 where conspiracies were formulated by a few men under one roof, the Peasants Revolt was the quiet murmurings of unrest among many unhappy and angry people who finally got together under one leader. 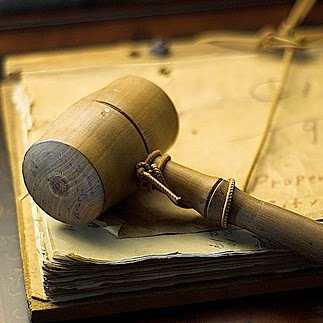 We get much of our information regarding the beginnings of the revolt from local level, in the form of court cases brought against villagers who took part in the early stage, people from the villages like Fobbing, Billericay, Gold Hanger and Bocking. Evidence of the events that took place in Brentwood on the last days in May are also found in written accounts and this is backed up by the Anonimalle Chronicle written at the time by a Benedictine monk from St Mary’s Abbey in York and a later inquisition headed by the Chief Justice of the King Bench and West County lawyer, Sir Robert Tresillian. History tells us that Bampton was in the Essex village of Brentwood in the May of 1381 to inquire into unpaid taxes, and he had summoned the inhabitance of surrounding villages to come to Brentwood and explain their non payments. The meeting soon got out of hand and men from three of the communities refused cooperate, violently forceing Bampton and his men at arms out of the village. 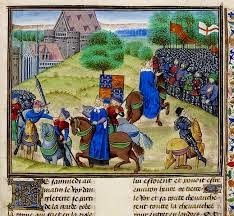 It was this one incident that was the catalyst for the Peasants Revolt, the troubles soon escalated and was followed by the rebelling peasants entering London on June 13th. “John Goldsborough, John Bampton and other justices of the peace with bows and arrows pursuing them them to kill them headed back to London." The events of 1381 ended badly for most, Richards II's promise to the peasants came to nothing, the charter that was signed later revoked, The peaseants leader, Wat Tyler was decapitated after trying to escape and two important members of the court, the kings Treasurer and the Archbishop of Canterbury are viciously murdered in the Tower of London by the rebels themselves. Of John Bampton after his return to London I cannot find any reference but the important question is what of the peasants, did they go back to tilling the soil, did they return to their fields like nothing had happened. Initially yes, but what these men eventually achieved was the breaking down of the century old feudal system which had kept them at the very bottom of life's ladder. Attitudes were changing, this meant that the poor man would no longer be beholden to a lord and master, he would be a free man. 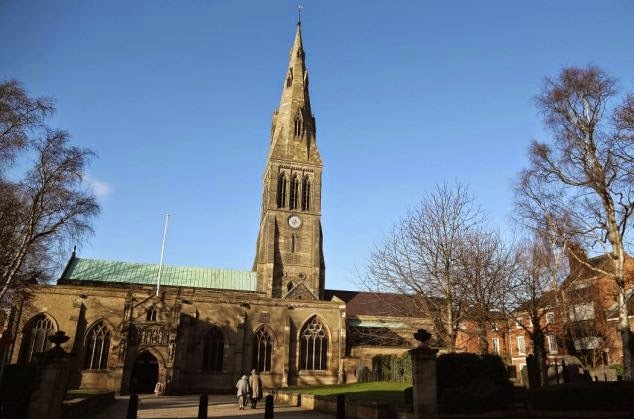 Richard III, The Judicial Review and Leicester's Cathedral. "For the reasons set out above, in our judgement, there are no public law grounds for the Court interfering with the decision in question. In the result, therefore, the Claimant's application for Judicial Review is dismissed"
As a supporter for the re internment of the mortal remains of King Richard III in the Cathedral in Leicester, I am pleased with the findings, but this was a case that should never have happened, instead of the discovery of Richard's remains adding a new chapter, it detracted and waylaid the course of Richards story totally unnecessarily. This year I have watched Richard the human being and Richard the medieval king fade into the back ground, he had become like an old toy placed on a high shelf, forgotten as a new arrival gets all the glory. This new arrival is a collective, a group whose members are the Judicial Review itself, the Plantagenet Alliance, and everybody else who climbed aboard the bandwagon, it became a separate entity that wallowed in Richards light, and its own story grew and grew Richard's became dimmer and dimmer, and it will I am afraid, never be forgotten. Out of the many issues concerning this case, I never understood the problem many had with Leicester University and the exhumation licence. It seemed to me, at the time, everything was done correctly and this has since been proven to be the case, and according to the official documents, it is this establishment who were the only ones who stayed true to their original statement, no dithering, changing of minds or sitting on the fence. Also I have never understood the reasoning behind all the accusations brought against the University of Leicester and the cities community cashing in on the discovery, or that the cathedral itself is some sort of monstrosity. What has the exterior aesthetics of this building got to do with anything and to argue this point is irrelevant in the least and insulting at most. Leicester's cathedral is never going to be as magnificent as that of York's, Lincoln's or Durham's, however, what is important is what's inside. Leicesters Cathedral is as beautiful inside as those previously mentioned, but its decoration is not what I am talking about, this building is house of God and this of course, would have been of importance to Richard and in that, just like any parish church, it is equal to any Cathedral in this country and that is why it is a suitable place in which to lay a king to rest. Returning to the judicial review, I would like to refer you to a piece of work by Matthew Lewis, who has, in his blog summed up quite brilliantly how I feel, about not just this case, but of King Richard III himself, he has also written of it in a way I could never aspire too. He, like me, just wants Richard's real story to be told but he like me thinks that the events of this year will be hung around Richard's neck along with that of the story of the two princes. I have to say at the contents of Matthew's blog truly tugged at my heart, he is a true Ricardian and has written a wonderfully passionate piece of work, so please do read it. You can find out what the plans are the the City of Leicester in this short video. To have a beard or not to have a beard, this is the question. Pogonotrophy is the act of growing and grooming facial hair, today it is not an issue, but in the past facial hair was, on one hand, a sign of virility, yet on the other, a sign of rebellion against the church and as we shall see, by Tudor times, a beard brought in much needed revenue. 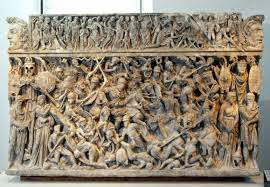 In Greek society, a man with a beard was considered wise and knowledgeable, Alexander the Great however, thought differently, he forced the men of his armies to shave, for he feared that an enemy could use the beard to their advantage thinking that they would grab at it during hand to hand combat and thus be victorious. I wonder how many of us who have become saddened and disappointed by the way Richard's journey has descended into squabbling, back biting and side taking, have now become anxious and concerned during the long wait for a decision over his re internment from the review board. If we are not careful apathy and/or boredom will set in. An article published this morning asks just that question. "Is all the legal wrangling the kind of thing that risks turning the public off? Leicester local historian Richard Gill believes it might. "I have no doubt the people of Leicester want to keep him here," he says. "I'm not sure they are that interested in the arguments." And in York, already a city famed for its historical sites, do people really care if Richard III is buried there? A BBC survey of people in the two cities suggested the dominant feeling was apathy. "I think it's all a row about nothing, York has enough history on offer. We don't need him here and - let's face it - he has been dead an awful long time. I think only a few people are actually that interested." Am I tired of waiting yes, am I less enthusiastic...certainly not! For many reasons I believe that Richard III should be re interred in Leicester Cathedral, but saying that I do respect the views of others, I see their point and understand their reasoning but among them there are those who complain of two things, the 'exploitation by traders', their words not mine, and the time its taken to re inter Richard's remains. What is wrong with a town using such a find to their advantage, the money which is made will benefit the community and the local people. What saddens me is all the nasty comments aimed at Leicester about this over the last year, if Richard was found else where wouldn't that city have done the same? Of course it would, and regarding the delay in re internment, whose fault is that? Certainly not the people of Leicester or its University or the members of it archaeological team, who by the way, seem to have become the proverbial whipping boy! 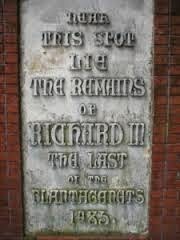 The thing is, if it had all gone to plan, Richard III would have been laid to rest by now. What happens if the review doe's not go Leicester's way, then what do we do? I don't think for one minute it will be straight forward, York, Fotheringhay, Middleham and Westminster or heaven help us, the fifteen or so 'family members' will try to claim him !! .........I'll see you all in court. "Although entitled to be buried at Westminster Abbey alongside other kings and queens of England, he announced his intention to be buried at York, and in 1483 set in motion plans for a new chantry chapel at York Minster." " I think it is pathetic to say that "York doesn't need him here because we already have enough history". It sounds like there would be more interest if they weren't already making money. I believe that Richard should be buried where HE wanted to be. Using his presence for money making purposes shouldn't even be a factor." Richards re internment continues to be a very emotive subject! Sadly, in a number of surveys that have been taken in the twenty one months following his discovery in Leicester, on the whole the general public were not particularly interested. You will be surprised, even here in the country of Richards birth, many people only know of him through the Princes in the Tower affair, many people have actually said to me "Who is Richard III?" The sad fact is, the quote from the person from York who said "he has been dead an awful long time" is another view widely held and that too maybe a reason many are not interested, on the odd occasion I wonder why, I have to remind myself that not everyone is as passionate about the life and times of Richard III as me. I have learnt much of Richards kingship and his religious beliefs over the years but what I/we do not know is where he wished to be buried, sadly he never left documents to this effect, if he had we may not be in the situation we are today. I am lucky enough live central to many of the places that Richard held dear and have family and friends who live in those communities, and also a number whose living is earned though 'history'. People in our towns and cities have to make a living, after all England as a whole earns millions from its history and many more millions from its tourism industry. Its ridiculous to think that communities shouldn't make any money from its past. Sadly England has lost many of its indigenous industries, so internal trade and tourism is important to us, of course it is not its mainstay but it is a vital part of our economy, therefore I have no qualms about paying to support our people and our heritage, and after King Richard III is re interred I will gladly come home with a bottle of wine and a fridge magnet with his image on it in support of whatever community he is laid to rest in. Where's the place to be in Cornwall today? Padstow of course! Its May Day and out comes a rather strange and somewhat frighting creature with a mask and circular black framed cape, gyrating its way through the village. It is of course the Obby Oss. There are several traditions such as this in Cornwall, but Padstow's is the most famous, beginning at the Golden Lion Inn at midnight with songs, and by dawn the pretty little fishing village is decorated with foliage, flowers and flags. During the morning the Obby Oss arrives, he dances, turning and swirling his cape as he moves through the villages tiny streets. Drums are banged and accordions played and all are led by what are known as Teasers who walk ahead, aiding the Oss as it tries to catch young maidens. There are two Osses in Padstow whose names are Old and Blue Ribbon, later in the day a number of smaller osses appear. By early evening the two will have met at the Maypole and danced together. The origins of this Cornish tradition dates back to the Beltane festival which celebrates the coming of summer or the Celtic worship of horse deities. It has been suggested that it may be related to the tradition of the Grey Mare in South Wales. Obby Osses are one of many ritual beasts and monsters found in English folk traditions, in addition to Padstow’s Obby Oss there was a tradition in West Penwith of a similar creature called Pengwyn and another named Penglas, meaning grey/blue head, which was probably a horse’s skull that is usually associated with other festive occasions such as the midsummer fire festival Golowan, celebrated in Penzance, which has quite recently been revived. There is mention of a Oss in the Cornish language play Beunans Meriasek, about the life of a saint from the Cornish town of Camborne and the Oss is a companion or follower. The origins of Padstows celebrations are, however, not really known. 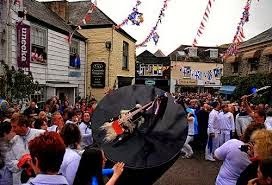 There is plenty of evidence of May Day celebrations dating back to the early sixteenth century but the first reference to the Padstow Obby Oss is 1803. In 1914 it was said of the dance performed by the Oss “The steps are improvised, consisting of various forms of back step, hockleback, swing steps. The Teaser every now and again passing by the side of the horse and facing him repeating the dance on the other side.” and if you click on the link below you can see this. Of the two Padstow Osses Blue Ribbon is the more recent, it was supposedly supported by members of the Temperance Movement who were trying to discourage the use of alcohol but after the Great War it was renamed the Peace Oss.